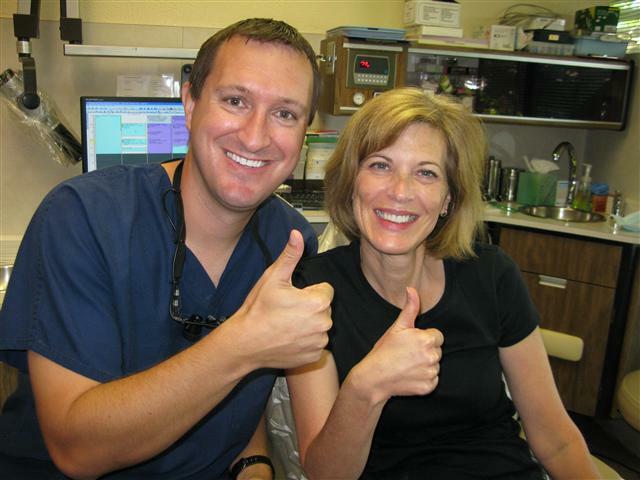 Pasadena Texas Cosmetic Dentist Dr. Nugent talk about Root Decay. Like all tooth decay, root caries is caused by bacteria. When your mouth is not kept clean, bacteria can cling to your teeth to form a sticky, colorless film called plaque. This plaque can lead to tooth decay. In addition, for root decay to occur, the root of the tooth must be exposed. Unlike the crown of the tooth that is covered by enamel, the root is made of dentin which decays much easier. Changes in the amount of saliva in your mouth can also put you at increased risk for developing caries. Saliva contains many chemicals that keep your teeth and mouth healthy. Many medications, chemotherapy, radiation treatments, and some diseases can cause your glands not to make enough saliva and therefore make cavities and other mouth problems more likely to occur. How do I know if I have root decay? Many people that have root decay do not know it. Because it occurs at or even below the gum line, the warning signs that often accompany tooth decay, such as sensitivity to cold or sweets, may be absent. In addition, as we age our teeth become less sensitive and may not warn us that the tooth is damaged. Often root caries is first found by Dr. Nugent or your hygienist during a professional cleaning or exam when we can feel the softened root with a dental instrument. Radiographs (x-rays) can be very helpful in finding root caries between the teeth. What can be done to prevent root decay? Since root decay is caused from bacteria, the most important thing you can do is to keep your teeth clean every day. If your gums have receded, cleaning can be more difficult. In addition to keeping your mouth clean, fluoride is very important in the prevention of root caries. Your diet is also a very important factor because certain foods and snacks can greatly increase the number of bacteria that forms the decay-causing plaque. Finally, frequent professional cleanings and exams can help prevent root caries or find it early when it can be more easily repaired. We are here to help you keep your teeth for a lifetime! Dr. Nugent’s office is located at 3421 Burke Rd Ste A, Pasadena, Texas 77504. He focuses on Cosmetic, Family, Implant and Sedation Dentistry. His amazing bed side manner and clinical skills make him a patient favorite. Our office sees patients from Pasadena, Deer Park, La Porte, League City, Friendswood, Sea Brook, and Houston, Texas.